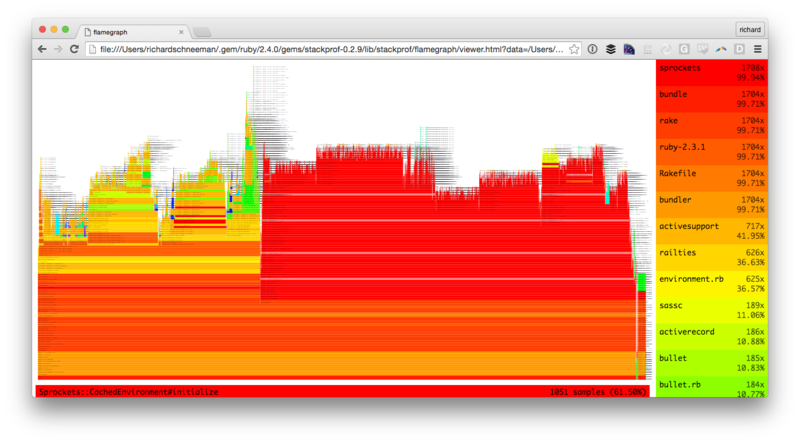 A sampling call-stack profiler for Ruby. Inspired heavily by gperftools, and written as a replacement for perftools.rb. Then run $ bundle install. Alternatively you can run $ gem install stackprof. 1660   (2.7%)        1595   (2.6%)     String#blank? 910    (1.5%) /    59   (0.1%)  |    21  |     !blank? signal handlers enqueue a sampling job using rb_postponed_job_register_one. this ensures callstack samples can be taken safely, in case the VM is garbage collecting or in some other inconsistent state during the interruption. stack frames are collected via rb_profile_frames, which provides low-overhead C-API access to the VM's call stack. no object allocations occur in this path, allowing stackprof to collect callstacks in allocation mode. in allocation mode, samples are taken via rb_tracepoint_new(RUBY_INTERNAL_EVENT_NEWOBJ), which provides a notification every time the VM allocates a new object. this technique builds up an incremental callgraph from the samples. on any given frame, the sum of the outbound edge weights is equal to total samples collected on that frame (frame.total_samples == frame.edges.values.sum). the profiler is compiled as a C-extension and exposes a simple api: StackProf.run(mode: [:cpu|:wall|:object]). the run method takes a block of code and returns a profile as a simple hash. this profile data structure is part of the public API, and is intended to be saved (as json/marshal for example) for later processing. the reports above can be generated by passing this structure into StackProf::Report.new. the format itself is very simple. it contains a header and a list of frames. each frame has a unique id and identifying information such as its name, file and line. the frame also contains sampling data, including per-line samples, and a list of relationships to other frames represented as weighted edges. above, A#pow was involved in 91 samples, and in all cases it was at the top of the stack on line 12. A#initialize was in 185 samples, but it was at the top of the stack in only 1 sample. the rest of the samples are divided up between its callee edges. all 91 calls to A#pow came from A#initialize, as seen by the edge numbered 70346498324780.
the profiler can be started and stopped manually. results are accumulated until retrieval, across multiple start/stop invocations. mode mode of sampling: :cpu, :wall, :object, or :custom c.f. interval mode-relative sample rate c.f. Generated on Thu Apr 11 11:53:29 2019 by yard 0.9.19 (ruby-2.5.1).